My friend Charles says it would have been Coltrane's 89th birthday today, which also made me muse a bit on how McCoy Tyner still seems indefatigable – he's playing the San Francisco Jazz Festival in a trio this year. 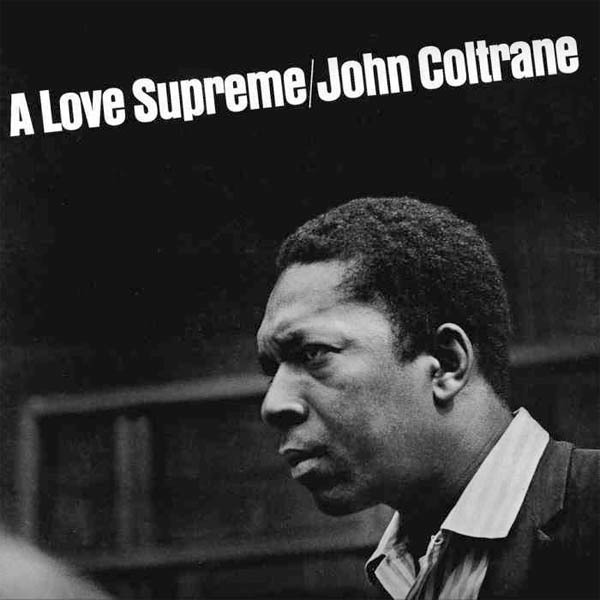 Anyway, A Love Supreme is an album that you will find on many, many best of lists. When you talk about an album like this you kind of wonder what you can really say or share about it that so many great writers and players haven't already said or shared before. To me this is one of those albums where the interface between the artist and the Universe was at its most fluid, as if Coltrane just opened up and the music poured through. It is an expression of such emotional intensity and incredible artistic beauty and I remember after first hearing it, it was pretty much impossible to put away. It's been reissued so many times, I think I had a single CD of it at first and then the version in the Complete Quartet box set and then not long after that came out a really great sounding Deluxe Edition came out. This one had one of the rare live recordings of the album from Juan de Pins which was also amazing and showed how Coltrane was just starting to go into the realms of the free and dissonant. The album isn't just canon for me, but would have to be very close to the top to any best of jazz list and probably any best of music list as well. And I still remember seeing Alice Coltrane years ago with her son Ravi and it was like you could feel this spirit in the room still, something timeless and eternal. Happy birthday, John.